All items sold as is, where is, so please examine your purchases carefully. NO guarantees on electrical/electronic devices. NO prices given out in advance. long sloping curved narrow driveway. PLEASE stay on the driveway. This is a large cul de sac with no sidewalks. Be prepared to walk, and to carry your purchases back to your vehicle. Please bring your own help to move furniture and large items. you must be present when your number is called. PLEASE respect the property of the owner and neighbors. PLEASE do not block any driveways as you will get ticket or tow. 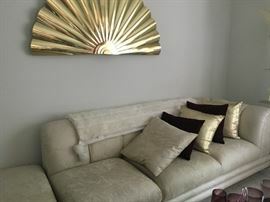 Sleek contemporary Jackson Furniture KY sofa with corner piece, decorative pillows and Artisan House brass wall fan signed sculpture! 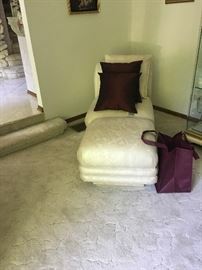 Matching Jackson Furniture KY armless chair section with ottoman and decorative pillows! Unique stone wall indoor waterfall! 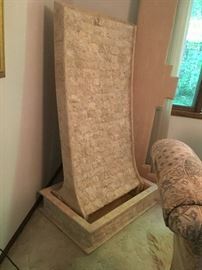 Another view of the stone wall indoor waterfall! 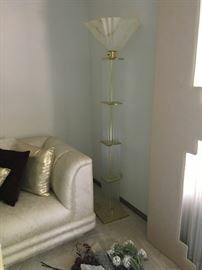 Amazing Lightolier modern brass and glass rod floor lamp with extra glass rods! 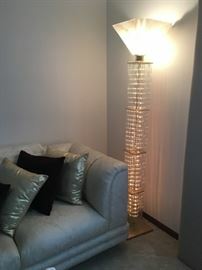 Amazing glass rod floor lamp lit up! Stoneville NC dining table pedestal with glass top and Stoneville dining side chairs! 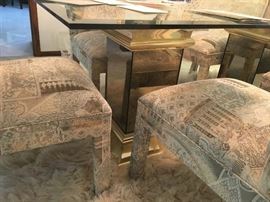 6 custom made Stoneville dining side chairs and double pedestal glass top Stoneville dining table! 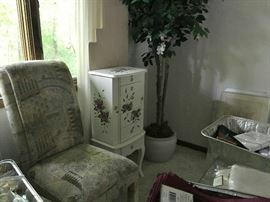 Hand painted jewelry chest, floral decorative tree, Stoneville dining side chair, napkins, placemats, and napkin rings! 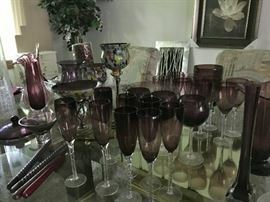 Lovely collection of amethyst glassware! 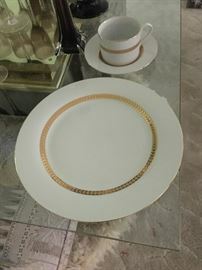 Farberware Imperial Gold 45 piece set of china! Art glass and wall art! Original mixed media abstract by local artist Mike Diggs! 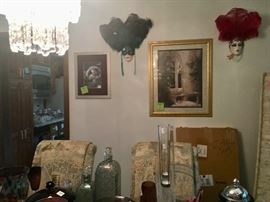 Assortment of collectibles, music boxes, glassware, Christmas goodies, and more! Another view of great collectibles! 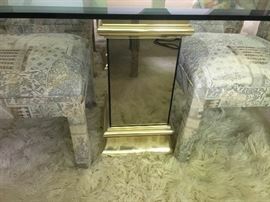 Chrome and mirror top console table with glassware! Great Acorn 7 step Chair Lift Superglide 130! New Acorn Chair Lift Superglide 130! Another view of the sofa and chrome and mirror top coffee table ! Costume jewelry, floral vase, and feather face masks! More costume jewelry new in boxes! Painted glass top coffee table, painted glass top end table, floral vase, wall art, and decorative pillows on the Stratford large 7 piece sectional sofa! More decorative pillows on the large sectional sofa! More pillows and more sofa! More pillows, shag area rug, painted glass top end table, and the other end of the ginormous sectional sofa! Both ends are recliners with a sleeper sofa in the middle! Outstanding Nova Lighting brushed aluminum and glass top lighted cocktail table! NOVA Lighting lighted cocktail table Not lit! 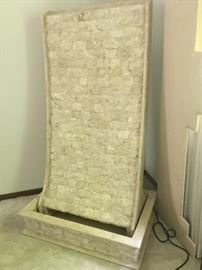 Cindy Crawford Home queen storage bed, nightstands, lamps, LG 32" flat screen TV, and Casana chest of drawers! Vintage Magnavox console TV on swivel stand, LG 32" flat screen TV, and brass and marble fireplace equipment! New bathroom accessories and more! Kitchenware , miscellaneous, clothing, and more! Placemats, napkins and napkin rings for entertaining! Mens and womens clothing with original tags! Garage garden tools, hoses and indoor outdoor vac! Shelves full of garage and garden supplies! Florals, walkers, and garage goodies! Scanner, shredder, organizers, candles, vacuums, and more! Vaccuums, mops, candles and more! Beautiful ceramic 22 piece nativity set!